Cougar Extreme VR - PC's are Designed to give you the best VR experience for your budget, expertly assembled and full of the latest components that are tried and tested by us. Take your gaming to the next level with a Virtual Reality headset that immerses you completely in the game world. 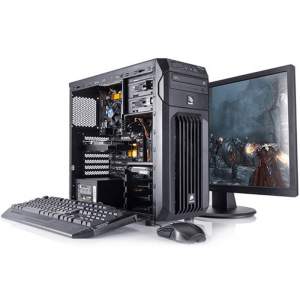 These high performance PCs feature the best NVIDIA GeForce graphics and the latest ATI graphics cards, with Intel Core i5 and i7 processors to deliver a smooth experience with Virtual Reality headsets such as the Oculus Rift and HTC Vive. Whether you're playing VR friendly games such as Elite Dangerous or developing games these systems have been specially designed to give you the ultimate Virtual Reality experience.